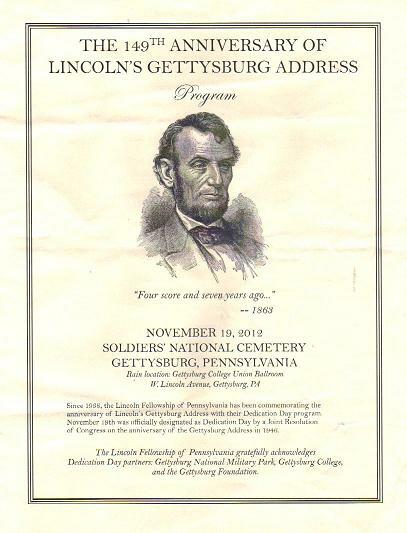 Each November 19 the town of Gettysburg commemorates the anniversary of the short speech that Abraham Lincoln made on that date in 1863 at the dedication of the Soldiers National Cemetery. 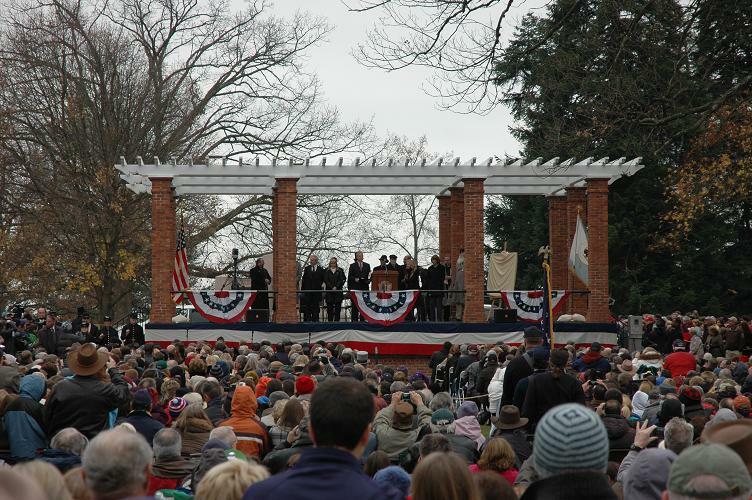 At this year’s commemoration the keynote speaker was director Steven Spielberg, whose film Lincoln had just opened. I drove down to attend the ceremony with my wife, Beth Ann, and Kyle Weaver, my editor at Stackpole Books. The 2012 Dedication Day program. It was a cool, gray November morning when we reached Gettysburg, where we discovered we were not the only people who decided to show up today. A sizeable crowd was gathering around the rostrum in the National Cemetery, including a good number of school students. We headed down to the Soldiers National Monument, which is closer to the actual spot where Lincoln spoke, because the day’s events would begin there with a wreath-laying ceremony. As people waited around the monument, the Federal City Brass Band performed some spirited Civil War-era tunes and patriotic airs. I was just happy I did not have to play a brass instrument on such a cold morning. Then a couple of black SUV’s rolled up with the guests of honor. I hurried over to get some photographs of director Spielberg and historian Doris Kearns Goodwin (whose book Team of Rivals provided the basis for much of the movie). They emerged from their car and were introduced to various people as I went into full paparazzi mode. I can have mixed feelings about Spielberg. Sometimes he ladles on the sentimentality and he has an unfortunate weakness for the group hug. Yet there’s no denying that he is a master filmmaker and his movies have become an inextricable part of the public imagination over the past several decades. The man has an undeniable touch behind the camera and has compiled a pretty amazing body of work. His movies include Jaws, Close Encounters of the Third Kind, Raiders of the Last Ark, E.T., Schindler’s List, Saving Private Ryan, just to name a few. And now Lincoln. 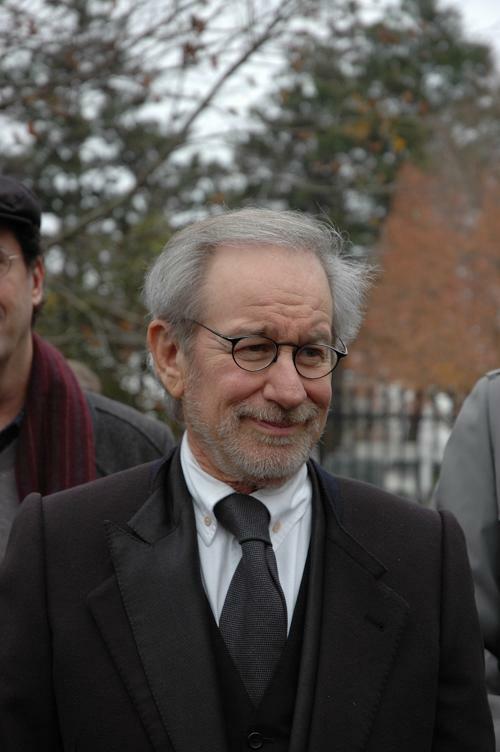 Director Steven Spielberg at Gettysburg for Dedication Day. I had seen Lincoln the night before and came away impressed overall. There are times when John Williams’ score teeters on the edge of self-parody as it attempts to push emotional buttons, but there are no group hugs and the film often made me think, “Yes, it must have been something like that.” Daniel Day-Lewis inhabits the role of Lincoln, with all his humanity and frailties. He does not play the president as a plaster saint but as a man comfortable with himself yet willing to do whatever it takes—including buying off reluctant legislators—to pass the 13th Amendment to the Constitution and end slavery in the United States. It’s mostly a story of politics, not war. Ulysses S. Grant makes an appearance, but there’s no mention of George Gordon Meade. Chances are historians will little note nor long remember what Steven Spielberg said in his Gettysburg address but he delivered a thoughtful, heartfelt speech to a crowed estimated at 9,000 people (including, he noted, “a healthy percentage of the country’s entire population of Lincoln obsessives”). He admitted to feeling humbled to be speaking here. “More than any other name connected to the Civil War, except Lincoln’s, Gettysburg’s reverberates,” he said. “Even Americans who don’t know precisely what transpired on these fields know that all the glory and all the tragedy that we associate with the Civil War resides most palpably, most indelibly, here.” He talked about the importance of scholars and historians for preserving collective memory and the importance of memory itself, as well as the need to acknowledge death in order to truly embrace living. “As much as we need memory to live, we need an awareness of death to live,” he said. “Surely that’s what cemeteries like Gettysburg are for.” He talked about his desire as a filmmaker to waken Lincoln from his one and a half centuries, if only for the two and a half hours of a cinematic dream. 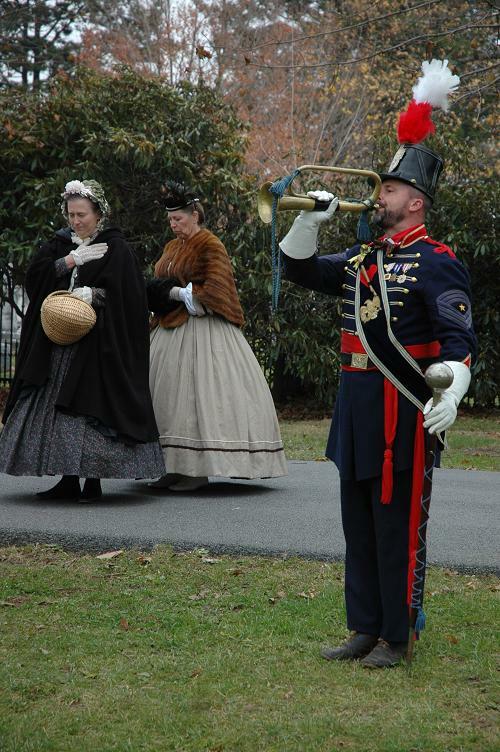 A bugler played “Taps” after the wreath-laying ceremony at the Soldiers National Monument. After Spielberg finished, Jim Getty, who has been portraying Lincoln for years, stepped forward to deliver the short address that provided the basis for the whole ceremony, all 272 words of it. A soloist sang “The Battle Hymn of the Republic,” followed by a naturalization ceremony in which citizens from 12 different countries became citizens of the United States. In a little touch that would not have been out of place in a Steven Spielberg movie, by the end of the ceremony the gray clouds had broken up enough to allow some faint rays of sunshine to peek through. All it lacked was the self-consciously stirring notes of a John Williams score. The story of Joshua Lawrence Chamberlain—the scholar-turned-general who led the 20th Maine at Gettysburg on July 2—is indeed a compelling one. The regiment’s main monument, on the spot where it made its stubborn defense on the right flank of Little Round Top, has become a pilgrimage site, with many people leaving notes and other tributes to the regiment’s men. 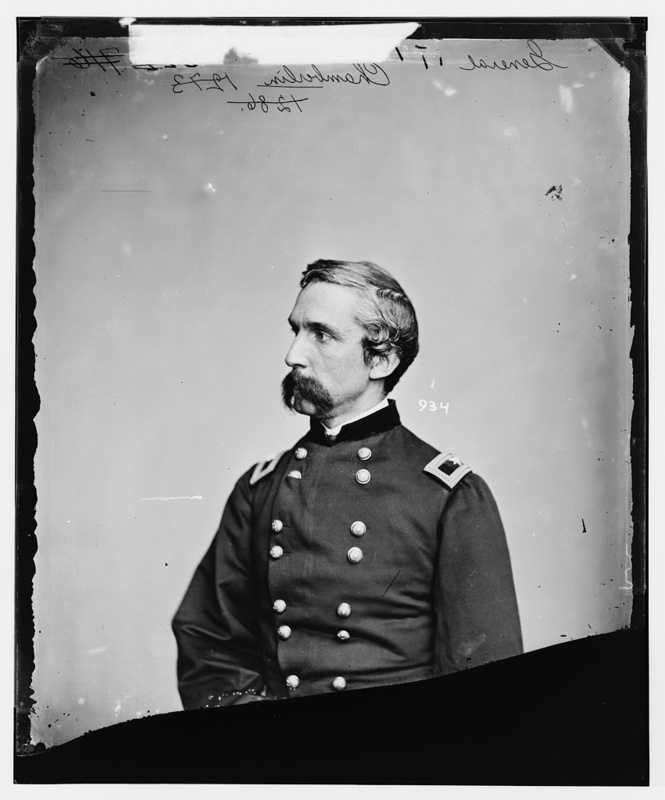 In Searching for George Gordon Meade: The Forgotten Victor of Gettysburg, I mention how it’s become somewhat fashionable to disparage Chamberlain and the 20th Maine. For example, in 2011 Gary Gallagher listed Chamberlain as one of the war’s five overrated officers. I guess you could call it a backlash. Michael Shaara’s novel The Killer Angels and then Gettysburg, the movie adaptation, propelled Chamberlain and his regiment to a new level of recognition and some people believe Chamberlain and his regiment now receive more credit than they deserve for the Union victory at Gettysburg. I hail from Maine myself and for a time I lived across the street from Chamberlain’s residence in Brunswick, Maine. Far be it for me to say that anyone from Maine is overrated! But rather than defending Chamberlain’s reputation myself, I’ll let his division commander, Brigadier General James Barnes, do it for me. This is what Barnes wrote in his official report of the battle. Joshua Lawrence Chamberlain (Library of Congress photo). Colonel Chamberlain at once threw back his left wing, and extended his right wing by intervals toward the left, in order to avoid diminishing the extent of his front. The brigade of the enemy alluded to reaching a proper position, attacked him furiously on the left flank, advancing within 10 paces and rapidly firing. They were first checked and then repulsed by the left wing of the regiment, thrown back for that purpose. A second, third, and fourth time the enemy renewed their attempt to break this line, and each time were they successfully repelled by that handful of men. Four times that little interval of 10 paces was the scene of a desperate conflict. The ground was strewed with dead and wounded men of both sides, promiscuously mingled. Their ammunition was exhausted; they replenished it from the cartridge boxes of the men lying around them, whether friends or foes, but even this resource soon failed them; the enemy in greatly superior numbers pressed hard; men and officers began to look to the rear for safety, but the gallant commander of the regiment ordered the bayonets to be fixed, and, at the command “Forward,” that wearied and worn body of men rushed onward with a shout. The enemy fell back. Pressing on, and wheeling to the right in open intervals, the left wing came again in line with the right wing, and then the whole regiment, deployed at intervals of 5 paces, followed up the advantage they had gained. The enemy threw down their arms and surrendered in large numbers; the others fled rapidly from the contest; 368 prisoners, including 1 colonel, 1 lieutenant-colonel, and a dozen other officers of lesser rank were sent to the rear; 50 of their dead lay upon the field, and large numbers of their wounded; 30 of this gallant regiment were killed, over 100 were wounded, but not one was taken a prisoner, and none were missing. It was now nearly dark. A portion of the enemy appeared to have occupied the summit of the rocky hill to the left. The men of this brave regiment, exhausted by their labors, had thrown themselves upon the ground, and many of them sunk at once in sleep. Colonel Rice, now in command of the brigade, directed Colonel Chamberlain to drive the enemy from this height. The order was at once given. Roused again to action, and advancing with fixed bayonets and without firing, lest the smallness of their numbers might be suspected, they rushed up the hill. Twenty-five more prisoners, including some staff officers, were added to the number previously taken, with a loss to the regiment of 1 officer mortally wounded and 1 man taken prisoner by the enemy. It was ascertained that these troops occupying the hill had been sent from Hood’s division, which was then massed a few hundred yards distant, and that their object was to reconnoiter the position as a preliminary to taking possession of the height. In addition to the prisoners above mentioned as taken by this regiment, 300 stand of arms were also captured by them, it is due to this regiment and to its commander that their service should be thus recorded in some detail. 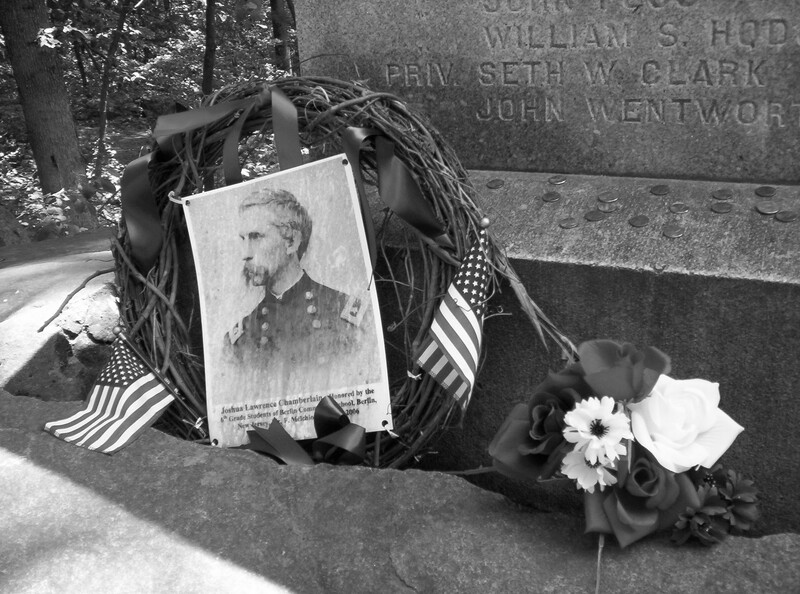 Colonel James Rice, who took over the Third Brigade in Barnes’ division following the death of Colonel Strong Vincent, also dedicated space in his official report to the action of the 20th Maine on Little and Big Round Tops, and singled out Joshua Chamberlain and his brother Thomas for their actions on July 2. “Especially would I call the attention of the general commanding to the distinguished services rendered by Colonel Chamberlain throughout the entire struggle,” wrote Rice. Barnes’ report appears in Official Records, Series I, Volume XXVII, Part 1, pages 599-605. Rice’s is in the same volume, pages 616-620.